As part of his Lieutenant’s promotional exam Dennis was given an assignment to work on updating the department FOG for apparatus placement at a scene. He had to turn in the updates on paper and provide diagrams illustrating apparatus positioning. StageIT is most often thought of as a tool for an instructor to use and create simple to complex emergency response simulations. Often overlooked are the schematic diagrams included in StageIT’s media library which allowed Dennis (the testee not the instructor) to quickly create some aerial view schematics illustrating apparatus placement. It took him about a half an hour to produce the four professional looking schematic illustrations included in this folder. Simple but effective. He did not want to use an aerial map image view to illustrate the placements because too much distracting detail was shown in the photo. With these schematics the focus is all on the placement of the vehicles. While the schematics Dennis created can be projected on screen for use in a classroom, he was also able to print them out to hand in with his assignment. StageIT provides an easy way to create real-world training solutions to enhance strategy and tactics planning, promotional testing and pre-incident planning. By the way, Dennis passed his exam with flying colors and is now a Lieutenant with the department. 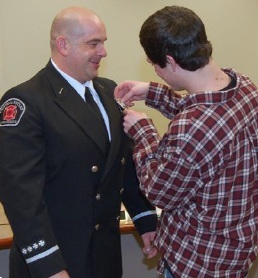 Pictured Above: Dennis Elliott with his son Austin at his badge pinning ceremony.